Merseyside Police have asked the public to send them footage of Manchester City's team bus being attacked at Anfield on Wednesday. Cans, bottles and flares were thrown at the bus as a crowd gathered before the 3-0 Champions League quarter-final first-leg loss to Liverpool. European football's governing body Uefa has opened disciplinary proceedings against Liverpool. City manager manager Pep Guardiola said he "doesn't understand" the attack. And his assistant Manuel Estiarte posted footage from inside the bus on social media and called the incident "unacceptable". No players or staff were injured but two police officers were hurt and the coach was left unsafe to be driven. 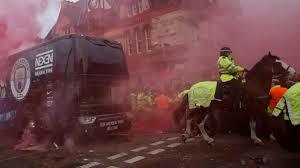 Uefa has charged Liverpool over the setting off of fireworks, throwing objects, acts of damage and crowd disturbances. "The charges of acts of damage and crowd disturbances relate to incidents involving the Manchester City team bus," a spokesperson said. The case will be dealt with by Uefa's disciplinary body on 31 May - five days after the Champions League final takes place. Before the match, Merseyside Police had issued a statement saying the two team coaches would "not be taking their usual route" because of "building works and to ensure the safety of fans". Liverpool also shared the statement and asked their supporters "to gather to show their passion and support for the team... in a friendly, respectful and considerate manner". However, Humb's Sport understands the police are unhappy at reports insinuating the route notification was partly to blame for what happened. They believe that not publicising the changes could have resulted in fans gathering along the original route then rushing en-masse to where the coaches did arrive instead. And they point out that both areas are close to Anfield and that fans were going to gather outside the stadium regardless. Merseyside Police match commander, superintendent Paul White, said two officers suffered cuts and swelling after one was struck by an object and another cut by glass during the incident. He said the force would do "everything in our power" to find the people responsible as they review CCTV and officers' body-camera footage. "We know many people were filming the events with camera phones and ask that anyone with any footage of the projectiles being thrown send it to a dedicated email address so that it can be reviewed: team.coach.incident@merseyside.police.uk" he said.